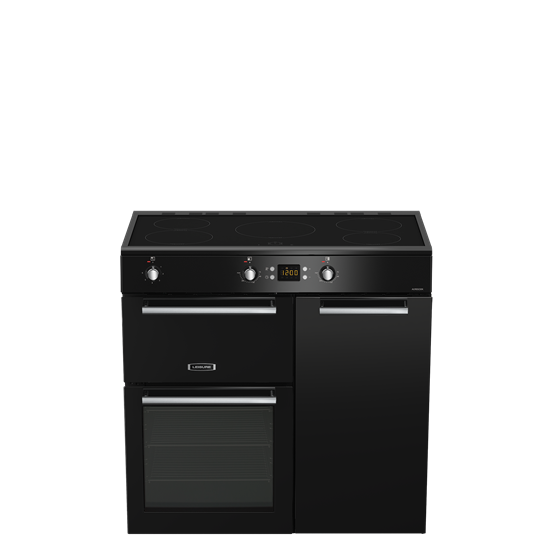 Prepare food like a professional with this A La Carte range cooker's five-zone induction hob, complete with touch controls. Providing rapid pan heating and effortless cleaning, the hob can also preserve energy by only heating up the pan you're using, instead of the whole cooking zone. Two ovens and a dedicated grill give you plenty of room for preparing large family feasts. And, the oven's Cook Clean liners make cleaning effortless by catching dirt and grease from inside of the oven. Feature-rich and satisfyingly simple to clean, the sleek and stylish induction hob offers responsive and rapid pan heating for fast cooking results. It's also incredibly energy efficient, heating the pan instead of the hob, making it the perfect option for the 21st century chef. Good Points: Don't know how I lived without an induction hob for so long, gives you heat like a gas hob, looks tidy like an electric hob, but is easier to clean than both. Bad Points: Tall oven seems too narrow and not enough depth for most baking trays, but some trays are out there, just take a measuring tape with you when you buy them. Bad Points: None. Although the hob temperature controls take a bit of getting used to. Good Points: Looks good and works well. Bad Points: The hob controls are fiddly.